dental clinics may not be your favorite place to visit, but sooner or later everyone has to go. these projects represent the best, most interesting, and novel approaches to dentist office architecture and design. madrid-based estudio arquitectura hago has sent us images of their new ‘dental office’, positioned within the second floor of a building in málaga, spain. 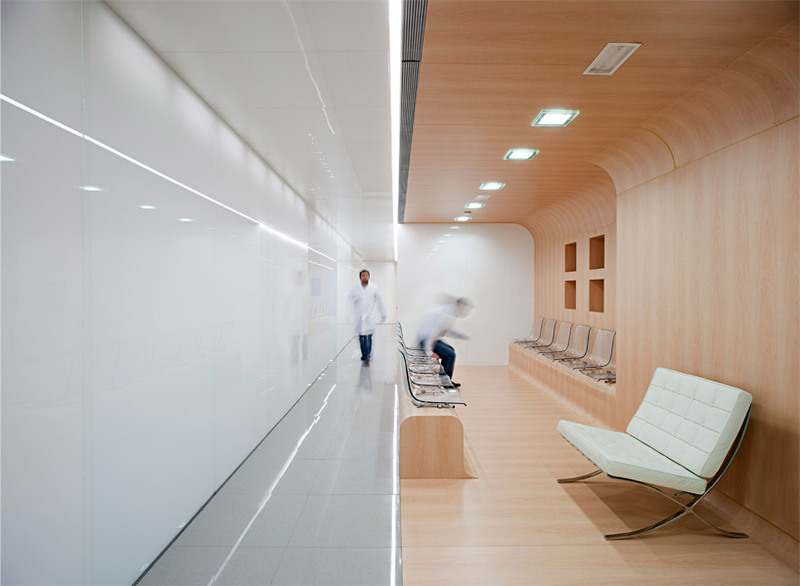 wrapping the center of the spatial layout, a white translucent glass wall forms a luminous corridor which links the public areas and patient rooms. the interior functions follow an unenclosed programmatic progression, beginning with the reception and waiting area contained by a folded and curved wood partition. after turning the corner, the following laboratories, storage, sterilization, offices and medical rooms are revealed. placed along the north-facing facade, natural lighting floods the perimeter patient rooms and is graduated through the glass into the waiting areas. Where is the Privacy gone?????? besides the obligatory barca and eames chairs. looks really fresh, nice contrast between a highgloss medical environment and a more natural homelike ambiance. but i have to admit that i would also appreciate some privacy during my consult! Nice project. I would love to have a dentist with an office like that! I live in Montreal, Canada and NEVER seen anything like it. How is it possible that a country with so many economic problems, still produces such beautiful projects, while more ‘stable’ countries like Canada, has nothing like it? Wednesday 18th 0845 I’m supposed to have a consult with Bert. He’s my dentist. And more important: he’s one of my dearest friends. Nevertheless I would certainly cancel the consult if he would welcome me in a slaughterhouse like this. All that glossy white glass only reminds me of teeth. Some sort of dental fetish? The interior of the dentist seems to be very awesome. These kind of dental clinics are attract the patients .